Who was Little Turtle and why was this Native Indian chief famous? 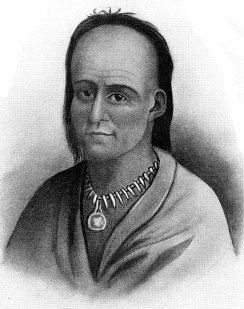 Summary: Little Turtle aka Michikinikwa (c1747 - 1812) was a famous war chief of the Miami Native Indian tribe of the Great Lakes region. Chief Little Turtle successfully led in raids on settlers in the Northwest Territory and is famous for his victory known as La Balme's Defeat and the 1791 Battle of the Wabash. Subsequent defeats forced him to sign the Treaty of Greenville (Ohio) in 1795. The following fact sheet contains interesting facts, background history and information about the life of Little Turtle and the events in history that led to his fame as a great Native American Indian leader. 1783: The 1783 Treaty of Paris ended the American Revolutionary War the British abandoned their native allies and ceded the land between the Appalachian Mountains and the Mississippi River to the United States (the Northwest Territory). 1785: The Western Confederacy was formed consisting of many different American Indian tribes including the Shawnee, Iroquois, Potawatomi, Ottawa, Shawnee, Delaware, Chippewa (Ojibwe), Kickapoo, Wyandot and the Seneca tribes. The objective of the Western Confederacy was to keep the Ohio River as a boundary between Native Indian lands and the United States.